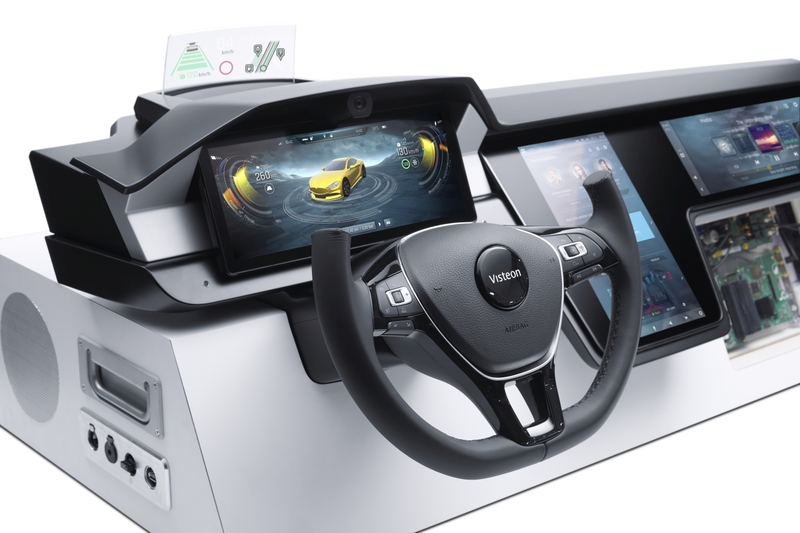 Visteon Corporation (NASDAQ: VC) today announced full-year 2017 results, reporting net income attributable to Visteon of $176 million, or $5.47 per diluted share, including $14 million of restructuring expenses and $31 million of other net expenses, partially offset by $17 million of net income associated with discontinued operations. Full-year sales were $3,146 million, a decrease of $15 million compared with 2016, primarily attributable to the exit of Other operations, partially offset by an increase in Electronics Product Group sales. Net cash provided from operating activities was $217 million for full year 2017. 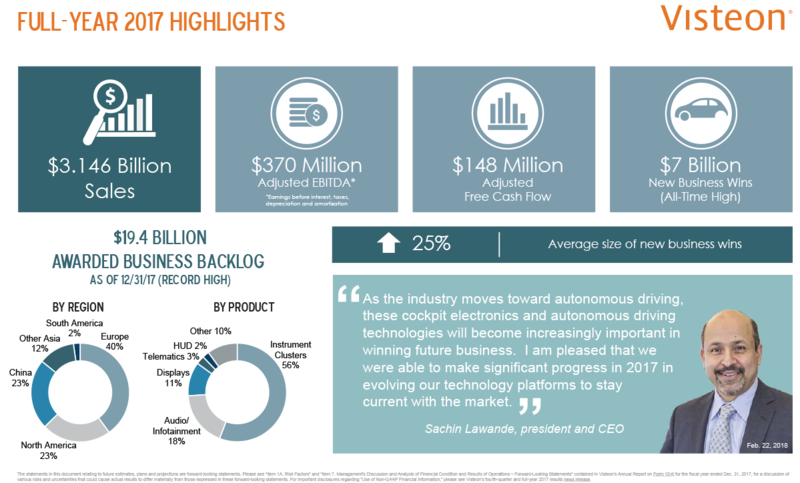 In 2017, global vehicle manufacturers awarded Visteon new business of $7.0 billion in lifetime revenue, with a record $2.4 billion in the fourth quarter. 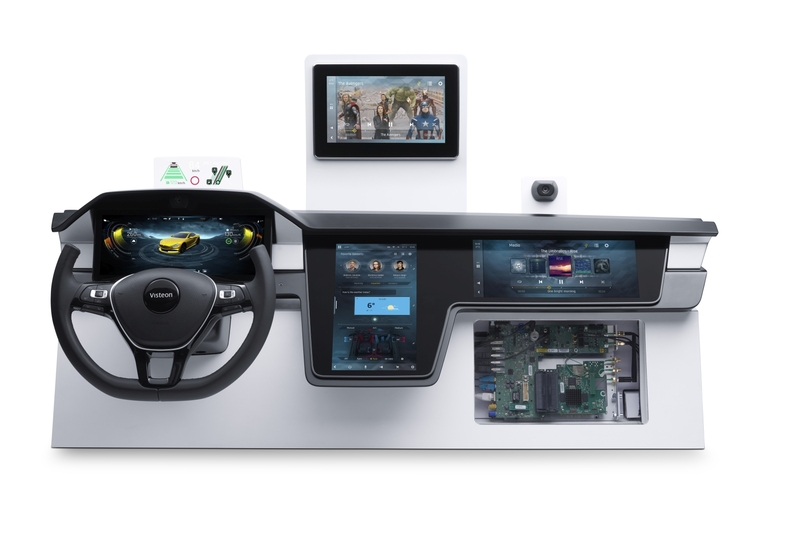 Fourth-quarter wins included all-digital instrument cluster wins with three global automakers – including the company’s first all-digital cluster win in Japan – as well as a software-only Phoenix™ win in Europe. The ongoing backlog, defined as cumulative remaining life-of-program booked sales, was $19.4 billion as of Dec. 31, 2017, up from $16.5 billion at the end of 2016, an increase of 18 percent. Fourth-quarter sales were $797 million, compared with $816 million for the same period in 2016. The $19 million decrease is primarily related to the exit of Other operations and customer pricing, partially offset by Electronics product launches and favorable currency. Gross margin was $140 million, compared with $129 million a year earlier. The $11 million increase reflected higher gross margin related to the Electronics Product Group. Selling, general and administrative expenses were $64 million for the fourth quarter of 2017, compared with $57 million for the fourth quarter of 2016, driven primarily by higher information technology investments. Net income attributable to Visteon was $25 million or $0.79 per diluted share, compared with $2 million or $0.06 per diluted share for the same period in 2016. 2017 fourth-quarter net income included $4 million of restructuring and $34 million of other expense primarily related to the divestiture of certain European assets, partially offset by $9 million in income associated with discontinued operations including a non-income tax settlement. Sales for the Electronics Product Group totaled $797 million, a decrease of $6 million from the fourth quarter of 2016. The year-over-year decrease was primarily related to customer pricing reductions, partially offset by new product launches and favorable currency impacts. On a regional basis, Asia accounted for 43 percent of sales, Europe 31 percent, North America 23 percent, and South America 3 percent. Gross margin for the fourth quarter of 2017 was $140 million, compared with $129 million a year earlier. The $11 million increase reflected the impact of improved engineering and material efficiencies, partially offset by customer pricing and unfavorable currency impacts. Adjusted EBITDA, as defined below, for the Electronics Product Group was $102 million for the fourth quarter of 2017, compared with $98 million for the same quarter last year. 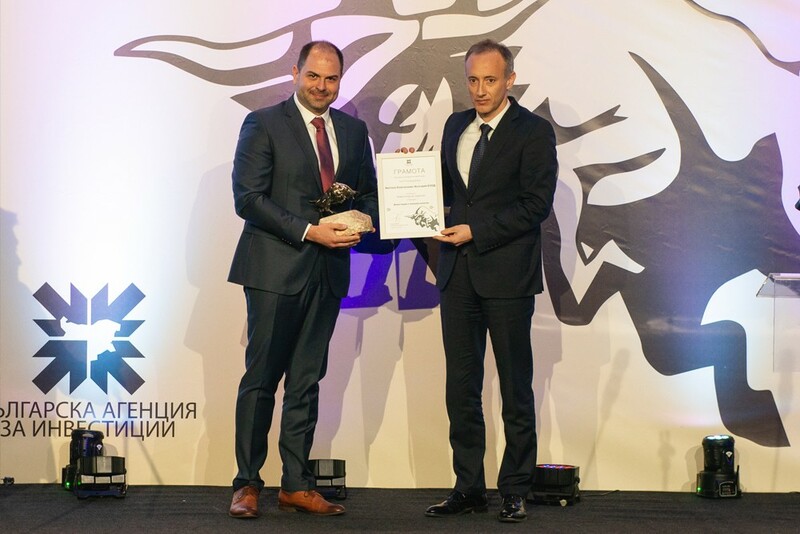 The improvement was primarily driven by favorable cost performance including material and engineering cost efficiencies, partially offset by customer pricing and unfavorable product mix. Adjusted EBITDA margin was 12.8 percent for the fourth quarter of 2017, 60 basis points higher than the prior-year. For the fourth quarter of 2017, net income was $16 million or $0.51 per diluted share, compared with net income of $20 million or $0.60 per diluted share for the same period in 2016. The decrease in net income included the 2017 loss on divestiture of certain assets in Europe, partially offset by a decrease in restructuring expenses year over year. Adjusted net income (as defined below), which excludes these items, was $52 million or $1.64 per diluted share for the fourth quarter of 2017, compared with $52 million or $1.55 per diluted share for the same period in 2016. 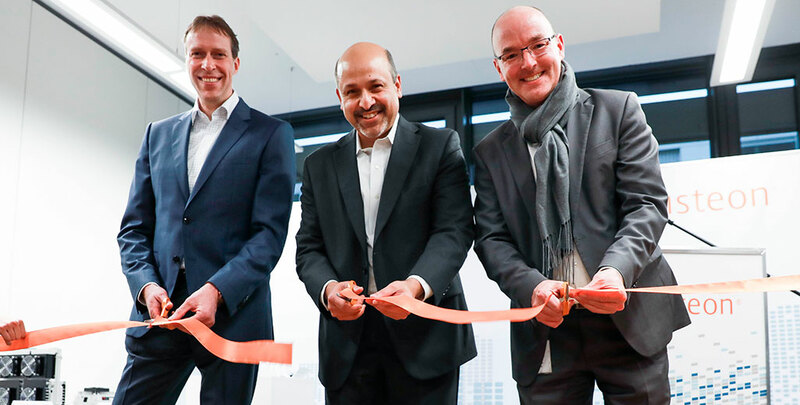 By the end of 2016, Visteon exited its Other operations, consisting of climate operations in South America and South Africa. The company did not have sales or adjusted EBITDA related to the Other operations in 2017. The fourth quarter of 2016 included sales of $13 million and net income of $7 million. Going forward, the company does not expect sales or adjusted EBITDA for the Other operations. As of Dec. 31, 2017, Visteon had cash and equivalents totaling $709 million. Total debt as of Dec. 31 was $393 million. For the fourth quarter of 2017, cash from operations was $86 million and capital expenditures were $30 million. Total Visteon adjusted free cash flow, as defined below, for the fourth quarter of 2017 was $58 million, compared with $82 million during the fourth quarter of 2016. Year-to-date, adjusted free cash flow was $148 million. 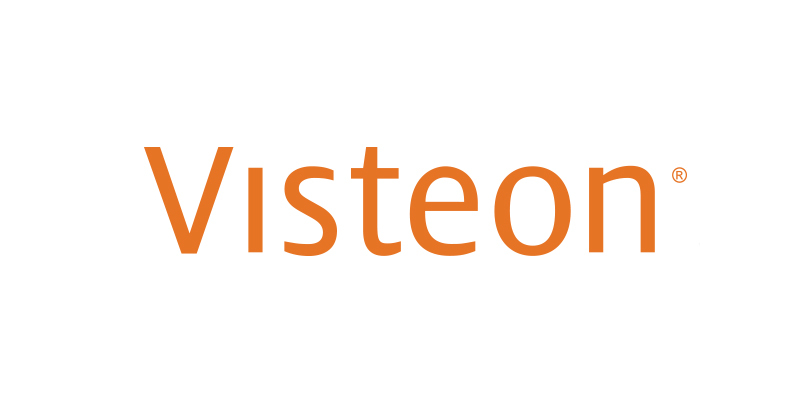 On Jan. 9, 2017, Visteon’s board of directors authorized the purchase of up to $400 million of the company’s shares outstanding. During 2017, the company completed $200 million of the authorized repurchases by acquiring 1,978,144 shares at an average price of $101.10. As of Dec. 31, 2017, the company had 31.5 million diluted shares of common stock outstanding. On Jan. 15, 2018, the company’s board of directors authorized an additional $500 million, for a total of $700 million of share repurchases to be completed over a period expiring on Dec. 31, 2020.